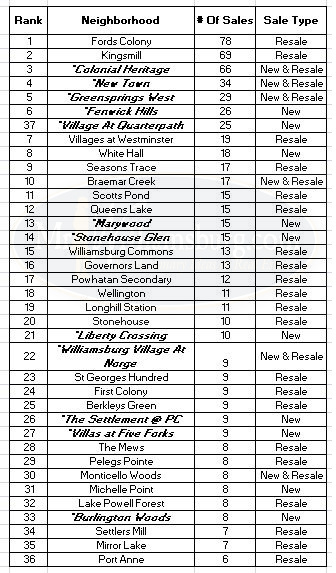 Time for a little recap of 2011 for Williamsburg, Virginia real estate. It’s always interesting to see which neighborhoods buyers were attracted to during their Williamsburg VA home search. Where were people buying homes in Williamsburg/ James City County in 2011 ? Well, let’s find out. Several new home neighborhoods in the area continued to sell well. Among them were Colonial Heritage, New Town, Greensprings West, Fenwick Hills, Village At Quarterpath, Burlington Woods, Liberty Crossing, The Village at Norge, Marywood, Stonehouse Glen, Braemar Creek, The Settlement at Powhatan Creek and the Villas at Five Forks. Of the 660 home sales on this list over 30% of them were new home sales. * figures were complies from the (WAAR) Williamsburg Assoc of Realtors WMLS and from local tax records. I would love to help you find your dream home and community in the Hampton Roads or Williamsburg area or to sell your existing home.This post was authored by local resident and REALTOR, John Womeldorf. John is known around town as Mr. Williamsburg, for both his extensive knowledge of Hampton Roads and the historic triangle, and his expertise in the local real estate market. 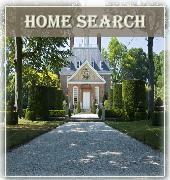 His websites, WilliamsburgsRealEstate.com and Mr Williamsburg.com were created as a resource for folks who are exploring a move to Williamsburg, VA , Hampton Roads VA and the surrounding areas of the Virginia Peninsula.